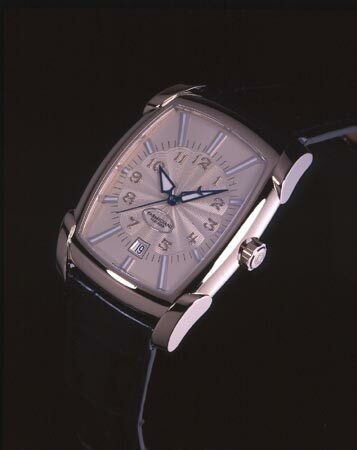 The Forma Grande Soleil features a silvered dial done in a guilloche style known as “soleil” or sunburst. The case is in 18kt white gold, measuring 46.6mm X 34mm X 9mm. Movement is the Parmigiani caliber 331.01, adjusted to 5 positions, with 32 jewels and a 22kt gold rotor. Power reserve is in excess of 55 hours. The dial can be had with Top Wesselton VVS quality diamonds. The crystal is a convex sapphire, and water resistance is good to 30 meters.